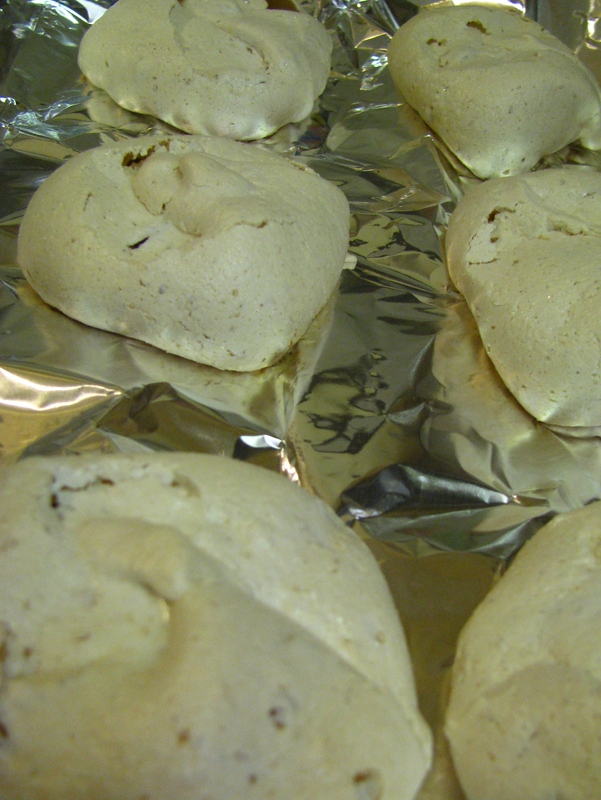 Meringue cookies are a yummy sweet treat. I wanted to create something different. There are recipes out there for meringue. You can make the original meringue, which is pretty much egg white, sugar, pinch of salt and just beat until you get a silky creamy stiff blend. What I did was added a pinch of cinnamon, dried figs and walnuts. Chopped them all up and used a plastic spatula to mix everything together. Then take a tablespoon or an ice cream scooper and place them on a baking sheet and place in a 350 to 375 degree oven. Cook for about 15 minutes until lightly golden. Let cool for about 2 hours or longer. Once you bite into one, that chewy sweetness will make your taste buds scream for more. Tip: When adding fruit or anything to a meringue just make sure its dry and that you don’t have any juices going into the mix; because that will make it watery and your cookies will not turn out. So try out some dried fruits like strawberries, peaches or whatever you find and add some nuts if you would like. I love Meringue cookies. It reminds me of my childhood.